In July 2010, the UUFCM became the proud owners of our very own building at 319 S. University Ave. in Mt. Pleasant, Michigan. The late nineteenth-century structure was originally a private residence that was converted to a Christian Science Church facility in 1890. It was the home of Art Reach of Mid Michigan for many happy years. The recital hall (worship space) seats up to one hundred persons and features an inverted parabola ceiling that beautifully enhances the acoustics of the room, making it a delight for music and narrative performance. The room also features a lovely Steinway & Sons baby grand piano. Looking for the perfect setting for a small wedding, banquet, or other special occasion? 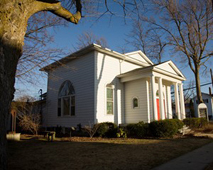 A wide variety of groups are welcome to rent our facilities, as long as they support values consistent with our Unitarian Universalist principles. Renters must also agree to follow all rules as specified in the rental agreement. For information about availability and fees, please contact our rental manager Gisela Moffit. You can also check our calendar to see existing reservations.